Developing a healthy sportsnack was the goal of a group of students Voeding and Diëtetiek at the Hogeschool of Amsterdam. In coöperation with the Food Lab HvA they developed the Power hotdog. This hotdog is made of seitan and lupin beans, packed with flavor and protein. 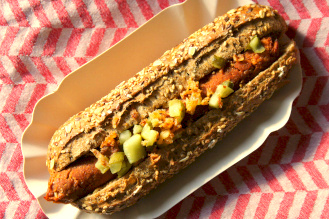 The HvA canteen serves the hotdog on a whole wheat bun with pickles and fried onions. Cut the onion and garlic in the foodprocessor. Add all ingredients in the foodprocessor except the wheat gluten and chop to a uniform mass. Pour the mass in a mixing bowl and add the wheat gluten little by little, until everything is mixed. Divide the mixture into portions of 80 grams. This role to sausages of about 2 cm thick. Turn every sausages in a piece of microwave film and tie the ends with kitchen twine shut. Fill a large sauce pan with water up to 8 cm below the rim. Bring the water to a boil and cook the sausages in 40 minutes. Remove the sausages from the pan and let them cool down, remove the foil. Bake or grill the sausages in vegetable oil around. You can keep the hotdogs in the refrigerator or freezer. The unbaked hotdogs are also delicious, for example on a sandwich.